Debon, Nicolas. A Brave Soldier. Toronto, Ont. : Groundwood /Douglas & McIntyre, 2002. Print. War is and always has been a touchy subject. The Great War in particular is apart of Canadian (and world) history that will never be forgotten. It was a world war but more often then not it, is not the world that we see represented in images depicting the war or those who fought in it. The image presented is not one of racial diversity, which is what the world is made of. Due to this many may find it difficult to identify with the history that is being taught, this especially applies to children. Children may not always find a history lesson particularly interesting but if they can picture themselves in what they are learning about it may make their learning experience more interesting. 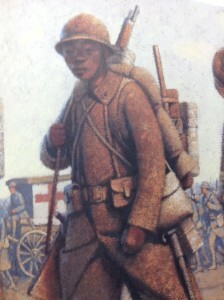 In Nicolas Debons book A Brave Soldier there is an illustration of an African Soldier. Although his role is minimal it raises the important question of representation in the Great War, more specifically the role of African Canadians and their contribution to it. 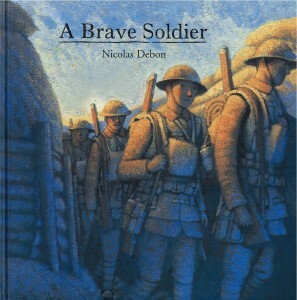 A Brave Soldier was written and illustrated by Nicolas Debon and was published in 2002 by Groundwood books. It is a story about a young man named Frank who enlists to fight in the war with thoughts that it would be over soon and he would be sent home by Christmas. Frank reluctantly enlists to fight in the war as to not appear as a coward to his peers. When the story begins to unfold we as readers learn that the story is not about how or why the war started but rather, the experiences of the soldiers at the battlefront. What Frank experiences is unlike anything he has ever experienced before. He goes through training and is eventually placed on the battlefront. One of his first encounters with another soldier who has seen and experienced what it is like on the battlefront is of African descent. The soldier describes his experiences as comparable to being in hell. Although Frank is scared he continues on to the battlefront. Through Debons illustrations he is able to depict scenes of war without being too graphic. Despite not being graphic the story that is told puts in perspective what war life is like for those who choose to fight. Even though Frank is a fictional character what he experiences on the battlefront are the experiences of many. Debons depiction of an African soldier also adds some depth to the story. The war Frank is fighting in is a world war but oftentimes it is not the diversity of the world we see depicted in war or in children’s books. Debons inclusion of an African soldier gives Black children -regardless of cultural background- something to identify with. They can begin to see themselves as part of not just Canadian history but history in general outside of the context of slavery. Usually when any kind of Black history is taught it almost always about the enslavement of Africans in North America. There are children’s books dedicated to telling the story of plantation life, the civil rights movement and some books that depict Black contributions to American history but it is rare to find any books on Canadian Black history. It is almost as if once slaves escaped to Canada they no longer had a place in history. There is no back-story to Debons African soldier, he appears once and is never seen or heard from again. Despite this, he has an entire page dedicated to his illustration. He is not a random face that appears in the background. He is right front and center. Debon must have wanted him to be noticed and have presence within the story. In the preliminary manuscripts and drafts for A Brave Soldier the African soldier was not included at all. The soldier was unnamed and his ethnicity was not specified. In later revised versions the soldier was said to be French. In the final draft and published copy of the book the soldier was made to be African. There was no given reason as to why this changed it was just by chance that Debon finalized the ethnicity of the character to be from Africa. Another important thing to note is that in the illustration the soldier is depicted as carrying not only supplies crucial to his survival but he is also armed. Historically speaking Black men were not allowed to fight alongside their White counterparts for no reason other than the colour of their skin. The fact that the soldier is armed shows that he must have fought as well, as opposed to just assisting in carrying ammunition or food rations. The inclusion of an African and possibly Canadian soldier helps to illustrate the diversity and multiculturalism that Canada prides itself on. It also helps to depict that World War One was more than just a so called “white mans war”. According to the British library the outbreak of the First World War happened in three stages. The first stage being, when Austria-Hungary declared war on Serbia after the assassination of Archduke Franz Ferdinand (Stevenson). The second phase of war outbreak took place when the conflict between Serbia and Austria-Hungary began to spread. The conflict spread to Germany, Russia and France. The third phase took place when Germany invaded Luxembourg and Belgium with an intervention from Great Britain (Stevenson). When war broke out in 1914, black men were initially rejected from enlisting in the army. “In August 1914 when World War One erupted Black Canadians received a devastating signal that they were considered third class citizens” (Ruck, 11). They were turned away simply because of the colour of their skin. Race is no indicator of someone’s capabilities and yet this was the sole deciding factor in their rejection from enlistment. There were no laws in place banning Black men from enlisting it was left up to the commanding officers that were at recruitment stations. Many of the Black men who made attempts at enlisting were told that it was a “White mans war” or that a checkerboard army was not wanted (Ruck, 12). At this point in war history Black men were thought of being incapable of fighting in the war. There was no evidence to back up the assumption that Black men would not make good fighters but it was the assumption that reverberated throughout many of the recruitment stations. The fact that Black men were rejected from enlisting shows that they were never really considered full members of Canadian society. Not being a full member of Canadian society also meant that they were not thought of as being able to be patriotic towards their country. Eventually a general order was put in place that said that Black -or Colored- men who were physically fit were not to be discriminated against when trying to enlist (Ruck, 15). Despite an order being put in place Black men still faced large amounts of discrimination and racism once enlisted. It was clear that even though they had been allowed to enlist they were not wanted or accepted by their commanding officers or fellow soldiers. What resulted from the initial rejections and mistreatment of Black recruits was the formation of an all Black construction battalion. Involvement in this battalion was the only way that Black men were able to contribute to the war efforts on behalf of Canada when stationed abroad. At home both Black men and women contributed to the war efforts. They worked in factories making weapons and other supplies as well as made efforts in helping to raise money that would then be put towards the war efforts. In spite of the fact that they were thought of as third class citizens Black members of Canadian society did all that they could in order to contribute to the war efforts. It is almost ironic that although they were met with racism and discrimination Black citizens did all they could in order to show their patriotism to their country. The No. 2 Construction Battalion was the first and only Black battalion in Canadian military history (Ruck, 21). Unfortunately this battalion was not made up of men who were to fight in the war but rather men who were to dig trenches and build shelters. Despite having their own battalion, the fact that the only work that Black volunteers were given was shelter building and trench digging says a lot about their position in society. Since these men were given the lowest of the low of jobs it is as if they were not deemed worthy enough to put their lives on the line for their country. In spite of their position on the battlefront their contribution to the war effort was something that should not be forgotten. A unique aspect about the construction battalion was that it was able to recruit volunteers from all over the country as long as they passed medical examinations. Although not physically fighting, the contribution of the No.2 Construction Battalion could be seen as a fight for equality. A fight for Black men to be seen as equal and worthy members of society who are able to show patriotism towards their country. A notable member of the No.2 Construction Battalion was Rev. William White. Rev. White was the second Black man to study at Acadia University in Nova Scotia and he went on to graduate with a degree in Theology in 1903. He also aided in the formation of the battalion itself. During wartime Rev. White would preach messages that promoted racial tolerance and hope. The reason why Rev. William White is an honorable mention in regards to the No.2 Construction Battalion is because he was the first Black man in Canada to receive a Doctorate in Theology. This honor was bestowed upon him before his death in 1936. The No. 2 Construction Battalion did more than just break down racial barriers. It gave Black men an opportunity to show their patriotism towards their country. It gave their families and children hope for a better and more equal future. A future that would be accepting of them regardless of the colour of their skin. A future that could recognize their efforts as worthy of acknowledgement in the public eye. A future that gave their children a history that they could be proud of. It is possible that the No. 2 Construction acted as inspiration for Debons representation of an African soldier in his picture book. Regardless of what inspired him to include this character it raised the important question of representation that was answered here in this exhibit. Black Canadian history is something that is not often remembered let alone taught. It is important that all members of Canadian society whether they were born here or not are able to see themselves within Canadian history. By depicting an African soldier in his book Debon gives African Canadian children an opportunity to identify with Canadian history. Oftentimes African Canadian history revolves around the runaway slaves who escaped to Canada via the Underground Railroad. African Canadian history is more than just escaped slaves. Despite not being as recognizable as African American history, the history of Blacks in Canada is a history that should never be ignored. Canadian children of all racial and ethnic backgrounds should be able to see themselves represented in the pages of history and in the media that surrounds them. It has gotten to a point where “white” has become the default for who and what is represented. The No. 2 Construction Battalion is just one small part of African Canadian history and there is much more that should be explored and acknowledged. Debons illustration sparked an interesting observation about the history of the Great War and hopefully this observation will start to generate some discussion on what it really means to have a “World” war. Black Canadians In Uniform. Veterans Affairs Canada. Web. 27 Feb 2014. Ruck, Calvin W. “Chapter 1: The Rejection of Black Volunteers and Chapter 2: No. 2 Construction Battalion.” Canada’s Black Battalion: No. 2 Construction, 1916-1920. Halifax, N.S. : Society for the Protection and Preservation of Black Culture in N.S., 1986. 11-30. Print.